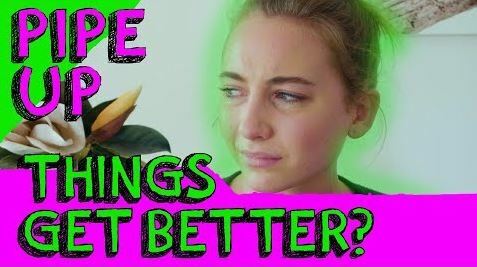 Name of Webisode: Part 51 - Things Will Get Better...Right? Piper is at Sonya's Nursery. PIPER: Hey, guys. So...I...this video you're about to watch has been sitting, like, on my desktop for a while, and I've been contemplating whether or not I wanted to post it. But...I've always wanted to be, like, completely transparent with you guys and I've decided to post it. Really, because I want everyone out there to know that no matter how bad a situation is, it's always going to get better. And there's always going to be a light at the end of the tunnel. And...I'm in that light right now, but the video you're about to see...I wasn't. Um, so, yeah, that was just a little bit of a disclaimer before you see my sad rambling. Cut to Piper sitting in the back room of No.32, some time earlier, wearing black. PIPER: So...today was...a big day. That's, like, a massive understatement. PIPER: Today was a really bad day. PIPER: ...yeah. And then, as I said, it was my exam today, my English exam...and I studied really hard for it. Like, really hard. I'm not like one of those people that'll say that...like 'Oh my God, I didn't even like study at all...!' like, and then they get...I worked *really* hard. Because I want to get into a media course and English is like the one thing that they look at, it was my most important subject and I needed to do well on it...and I didn't. PIPER: So...right before my exam, my boyfriend like, confronted me...you guys know who he is...Tyler. He confronted me and accused me of cheating on him. Like, cheating. Right before my exam. And it was just, like, so *weird*. Because he had these, like, print- outs from this guy's phone that apparently I'd been texting him. And he just kept being like, you know, showing me this print- out. And it was just, like, first of all, who prints out screenshots? That's just weird...and second of all, I have no idea what he's talking about. Like, clearly it wasn't me in those message. It didn't sound anything *like* me, and I said that to him. I was like, 'Tyler, this is obviously one of my trolls!' You guys know that a while ago I was doxxed, and that was like, horrific and all this stuff came out, and I was like, 'Tyler, it's obviously someone who has, like, doxxed me and is trying to get at you or something'. It didn't even sound like me, that's the thing. Like, there was this part that said, um, my God, what was it? She puts her fingers over her eyes. PIPER: It was like, apparently I said, 'I can't wait to go to the beach' or something about me loving the beach. She looks into the camera for emphasis. PIPER: I *hate* the beach. I hate it. And Tyler knows that. And I said that to him, I looked him in the eye and I was like, 'It's Not Me' and he...he didn't believe me. She turns to the window where she can hear sirens. PIPER:(to the sirens) Can you please shut up?! She looks back at the camera and laughs. Just then, a really loud siren blares and she sighs. PIPER: I was like, 'It's obviously not me' He just didn't believe me. PIPER: So then...after the exam, I came home and how could it get any worse? Of course it can, Murphy's law, don't ever say 'How is it going to get worse?' So I came home and Tyler was here, like, picking up his stuff. And you know when you fight with someone and you're like, normally, mutually, you both want it to end. I thought it was a petty fight...but I came home and he was, like, grabbing his things. And like, that's it. I just don't get it because, like, he wanted to believe it was true for some reason, and he wanted...it was like he was looking for an excuse to get out. And I don't even get a say in it, it just happened around me. I feel like it wasn't happening to me, it was happening so quickly...it just happened. She sighs again and rubs her face. PIPER: Doesn't feel like it's real. We worked *so* hard to be together even though we felt like everything and everyone was against us. We had to *fight* to be together, like, I *left home*. Like, I moved to the Backpackers to be with him. Like, for him, for *us*. I just, like...I put my mum through hell, I jeopardised my education, like, everything, for him. And now I feel like it was for nothing. Well, apparently it was nothing. She thinks for a while.